seminal work, Capitalism and Slavery. before the appearance of the first, nothing of note was written. Griffith, former Dean of Florida International University's Honors College. consisting of over 1000 titles. the Organization of American States' Americas magazine in both English and Spanish. present and for the future. When the University College of the Bahamas, the British Virgin Islands' H.
Memorial Collection they came visiting several times. indeed the world, in general. "Without a past, how can we look towards the future. This establishment is amazing!" "An inspiring experience. Propels one to soar to highest high. " "Thankyou very much for treasuring what is really ours. " The EWMC is about teaching, research, and community service. "What we research, is what we teach, is how we can give back." Professor Jane Brown, University of North Carolina, U.S.
2 visits to the country in the 1940s and again in 1975); two Trinid ad and Tobago Schools Stamp Design and Performing Arts competitions (co-sponsored by the Trinidad and Tobago Postal Corporation and UNESCO); the Launch of Eric Williams Centenary Stamps, with proceeds donated to the hearing impaired of Trinidad and Tobago; the publication of Williams dissertation, from which emanated Capitalism and Slavery; the re-issu e of the book in Brazil and Spain for the first time in some 40 years; the production of a 16-month histori cal calendar; and the online public ation of Williams bibliography, consisting of over 1000 titles. All of these efforts have been amply promoted in the local, regional and international media  from Londons British Broadcasting Corporation (BBC), and the British Virgin Islands Island Sun to the Organization of American States Americas magazine  in both English and Spanish. Thus, with all of its other endeavours, the EWMC is a model for th e Caribbean, a means of demonstrating to its younger generation the vital conn ection to the past  what that means for both the present and for the future. 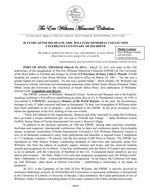 When the University Colle ge of the Bahamas, the British Virgin Islands H. Lavity Stoutt Community College and the Central Ba nk of Trinidad and Tobago, along with the latters UK consultants, sought point ers in the creation of their own museums, it was to The Eric Williams Memorial Collection they came  visiting several times. Guests of the EWMC Museum continue to be inspired by their experience, as were the Vice President of India ; the Prime Minister and former Prime Minister of St Vincent/Grenadines and Jamaica respectively; former Mayor of New York City Rudolph Giuliani Commonwealth Secretary General Prime Minister of Tonga and three Nobel Laureates Thousands of Trinidad and Tobago students along with sc hools/universities from Barbados ; Guadeloupe (including the Chamber of Commerce); Martinique; St. Lucia; Suri name; US Virgin Islands ; Mauritius; UK; US have toured the facility since it s inception. While a mere 20 school s visited in 2001, this figure had quadrupled within two years. And the young continue to demonstrate their pr ofound comprehension as they speak, following, to what the EWMC means to the population at large and, as important, what it will mean to future sons and daughters of Trinidad and Tobago, in particular, and of the Caribbean, indeed the world, in general. A deep sense of awe and respect, pride, des cends upon me in this place. A remarkable collection. Romaine Vularoel Without a past, how can we look towards th e future. This establishment is amazing! Nicola Whitley, Trinidad and Tobago student An inspiring experience. Propels one to soar to highest high. Sophia Almorales, Trinidad and Tobago student Thank you very much for treasuring what is really ours. Kimberley Correia, Trinidad and Tobago student The EWMC is about teaching, research, and community service. What we research, is what we teach, is how we can give back. Professor Jane Brown, Univer sity of North Carolina, U.S.
2 and Performing Arts competitions (co sponsored by the Trinidad and Tobago Postal Corporation and UNESCO); the Launch of Eric Williams Centenary Stamps, with proceeds donated to the hearing Capita lism and Slavery ; the re issue of the book in Brazil and Spain for the first time in some 40 years; the production of a 16 consisting of over 1000 titles. All of these efforts have been amply promoted in the local, regional and international media B ritish B roadcasting C orporation (BBC), and the British Virgin Islands Island Sun to Americas magazine in both English and Spani sh. Thus, with all of its other endeavours, the EWMC is a model for the Caribbean, a means of demonstrating to its younger generation the vital connection to the past what that means for both the present and for the future. When the University College of the Bahamas Lavity Stoutt Community College and the Central Bank of Trinidad and Tobago UK consultants, sought pointers in the creation of their own museums, it was to The Eric Williams Memorial C ollection they came visiting several times. Guests of the EWMC Museum continue to be inspired by their experience, as were the Vice President of India ; the Prime Minister and former Prime Minister of St. Vincent/Grenadines and Jamaica respectively; form er Mayor of New York City Rudolph Giuliani Commonwealth Secretary General Prime Minister of Tonga and three Nobel Laureates Thousands of Trinidad and Tobago students along with schools/universities from Barbados; Guadeloupe (including the Chamber of Commerce); Martinique; St. Lucia; Suriname; U S Virgin Islands; Mauritius; UK; US have toured the facility since its inception. While a mere 20 schools visited in 2001, this figure had quadrupled within two years. And the young continue to demonstrate their profound comprehension as they speak, following, to what the EWMC means to the population at large and, as important, what it will mean to future sons and daughters of Trinidad and Tobago, in particular, and of the Caribbean, indeed the world, in gen eral. Romaine Vularoel Nicola Whitley, Trinidad and Tobago student Sophia Almorales, Trinidad and Tobago student Kimberley Correia, Trinidad and Tobago student The EWMC is about teaching, research, and community service. Professor Jane Brown, University of North Carolina, U.S.